SHIP: Solstice CABIN #:7211 DECK #:7 CLASS: 2A AREA: Port BED NEAR: Bath QUIET? : Very - no noise from elevators BALCONY VIEW: View to aft is blocked by cabins on the hump, can see all the way to the bridge BALCONY SIZE: First angled cabin on the hump so only slightly bigger WIND A PROBLEM? : No SOOT A PROBLEM? :No PROBLEMS/COMMENTS: When standing at railing, can see straight into the balcony next door (7209) so not private. The slightly bigger bit of balcony always had water pooled there. Not worth paying any extra for. Brisbane International Cruise Terminal Not Finished On Time? Don't believe everything you read. If there was a chance of it not being finished on time, then I'm sure we all would have got wind of it in Brisbane at least by now. If the grain terminal had to be used, then everything you would assume would probably happen there. The only times I've heard about people getting processed at Portside and bused to grain terminal was when there was a last minute change eg recently was too windy to get to Portside so docked at grain terminal and people were bused there. I think that it's a bit rude that the company who charges the most in the world for a drink package - and are also known to make weak drinks - has a daily limit. Captain Tasos doing his favourite donuts He is well known for them. Pity he wasn't on our cruise - the other captain is a little bit boring. Solstice - Pacific Islands cruise - how was it? There was a bit of coughing and stuff on board but didn't seem too bad but was only once we got back that we found out lots were sick - including me. I ended up with a chest infection or something once we got home and still taking antibiotics and can't shake it. There were about 100 people on our facebook group that answered a poll and over half of those were sick - flu or something else. At least 1 in hospital with pneumonia. If half of facebook got sick, can only imagine what percentage of the whole ship got sick. Some of the crew were off sick while we were onboard too. Looks like we got off as you got on. I wasn't looking forward to getting on and off at Princess Wharf but it was organised chaos. We were on in less then 15 minutes when we got there about 1. I can also recommend the discount taxis we found at the wharf ($40NZ for cash to the airport) and not recommend super shuttle. Hope you and the rest on board are healthy - a lot on our cruise got sick either on the ship or as we got off. Over half our facebook group came home sick. I'm on my second lot of antibiotics and still not 100% - and I never get sick so it must be something bad. I haven't mixed anything up. I was talking about the mast bar which is on the starboard side - which is smoking as per the above smoking policy. Noone has mentioned mast grill at all. All of the mast bar is the starboard side so the whole thing is smoking. There were ashtrays on all the tables and people sitting at the bar smoking constantly on the last cruise. 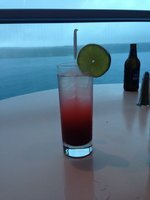 This was on the last cruise. Our nonsmoking bartender had told us the mast bar had been changed to a smoking bar but couldn’t remember when. We've just got back from this cruise and had a good time. Have just done a review so will be up in a few days. We were lucky and had pretty good weather and good seas. Not overly hot but more humid. This cruise seemed to attract the older crowd (more in their 60's and 70's but they look like they know how to party! LOL) I don't really like doing the cruise tours because they are so overpriced - but can see the benefits of doing them at these ports. We had to deal with rude -and some downright scarey people trying to find some good local tours especially Fiji. Did a local Suva tour from a mob that were set up on the wharf and wanted extra money midway through the tour - don't know the name but wouldn't recommend them. I wanted to do a local tour of Apia samoa but too many people were in our faces wanting to charge $100US for a taxi - rip off. Would suggest going to the Information Centre there - they put on a free cultural tour there for the cruise people. Lovely people there. We loved American Samoa and did a tour with Alofa tours $35US each - would recommend them. Tonga was a bit of a miss especially Vavau. Very unorganised there but they are trying. They were getting people to complete surveys at the end of the trip so they should improve for next years cruise. Would recommend ship tour here. We were watching some people get into some of the local boats there and they didn't look seaworthy. The town itself is tiny with little to see. In Nukualofa we were a little scared again of the local tours and taxis but after a look around town we hailed a local taxi who took us to the blowholes and saw the countryside for about 50 tongan. There were 2 tender ports - Bay of Islands and Vavau. Pretty sure it was American Samoa where some people we knew got eaten by the mossies. But they did some rainforest tour. I didn't see a mossie the whole trip. If you haven't booked a cabin yet, I would suggest one on starboard side. We were on port side and seemed to be on the wrong side every port. Just saw Sea Princess go past work near the Gateway Bridge, so nearly at Portside. I think everyone will be happy to be on solid ground again. P&O have just announced the 3 day cruise from Brisbane on Dawn on Saturday has been cancelled altogether. Not the best time to be on the water. My manager is on a 3 day cruise to nowhere leaving Brisbane on Saturday - I think she will be lucky to get out of the Brisbane River.